← iPhone X Is Great, But Is It Really Better Than Samsung Galaxy Note 8? I have been using the brand new Surface Book 2 for the past couple of hours. I am far more impressed than unimpressed, but I haven’t spent enough time with it to see all its faults yet. The version I am reviewing runs on an 8th-gen i7 processor, 8GB RAM, a 256 SSD, and a discreet NVIDIA GeForce GPU. It runs for $1999, but if you qualify for a discount from Microsoft, you can get $200 off. It may not be worth $1999, but it is definitely worth $1799, especially compared with the MacBook Pro with (almost) the same specs. 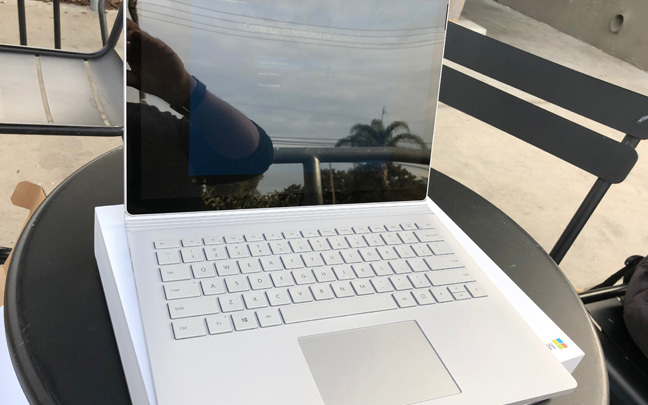 The Surface Book 2 is a well-built device. No major light bleed when first turning on unit. The hinge on the SB 2 is much stronger than the one on the first Surface Book. The tablet portion is what makes the SB2 feel more heavy than competing laptops. However, when you detach the tablet, it feels surprisingly light. The SB2 works well as a tablet. 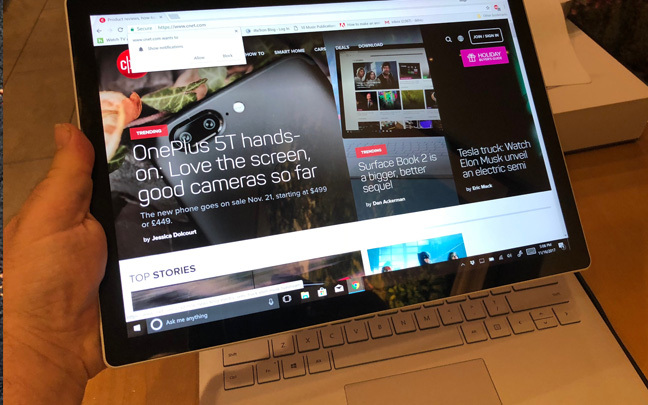 The Surface Book 2 screen makes a great tablet. The screen is crisp and clear. The contrast ratio isn’t quite as good as the MacBook Pro. Still, the screen easily gets a 9/10. Battery life appears to be exceptional. After one hour of use, I’m at 88 percent. They keyboard is a 10/10. I like the MacBook Pro’s butterfly keys, but it’s nice to have a notebook with keys that have decent travel on them. So far, the trackpad is the best one I’ve used on a Windows device. It’s not MacBook Pro quality, but very close. The speakers are also great — a slight improvement from the first generation book. This thing is FAST! The 8th-generation quad core processor really helps move things along. There is decreased bezel space on the screen, but just enough so you can grab it as a tablet and not worry about accidentally hitting something on the screen. When using Photoshop or CyberLink Power Director, there is noticeable coil whine noise, but nothing out of the ordinary. It’s still annoying. I wish I had the Surface Pen to test the digital inking capabilities. I am more impressed with the Surface Book 2 than I thought I would be. The overpriced Surface Book that was released in 2015 feels like a Beta product now. That said, the Book 2 will take a big bite out of your wallet. However, it may be worth it. 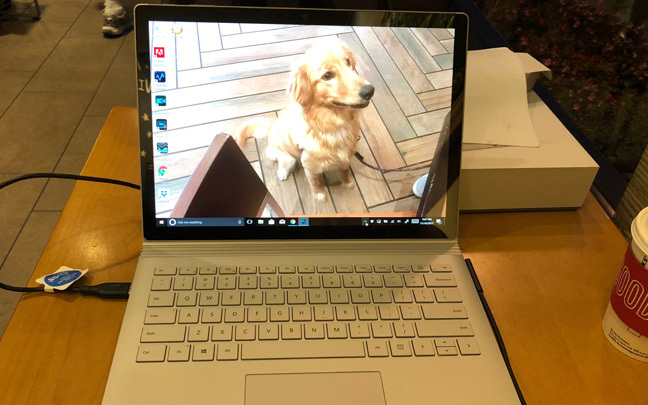 This entry was posted in Review and tagged MacBook Pro, Microsoft, Surface Book 2. Bookmark the permalink.